1. (+/-) Ethan, the protagonist - Ethan didn't bother or persuade me-- that is, I didn't really sympathize with him nor did I think he was too whiny or needy or whatnot. At the same time, he had such an edge to him, cursing and hysterically laughing that was just a little too rough for me to identify with him. Still he was having a hard time adjusting, so I tried to cut him some slack for that. 2. 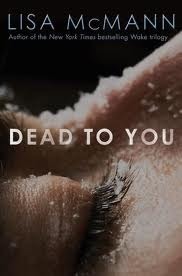 (+) The Concept - Dead to You is a contemporary but with mystery, so much mystery and familial tension, and though it involves a completely different type of unreliable narrator, the concept plays out so well. 3. (+) Different Genre - I haven't read Lisa McMann's paranormal stuff, but I admire her for doing something different, going out of her genre. This point is kind of like the concept point, but I felt like it needed to be reiterated because it was that fantastic. Sometimes you don't know if you can trust an author to handle another genre well, but you can trust Lisa McMann with Dead To You. 4. (--) Predictability - I predicted the ending of the book way ahead of time, and though the book compensates for that and puts an emotional spin to it, I was a tad disappointed by this. The mystery plays out well through the story, but knowing the ending kind of ruined some of it. Also the end didn't satisfy me. Plenty of character development through the novel, but that ending showed a regression and didn't let us know what came next - I can understand why McMann chose not to write further but still I was kind of disappointed. 5. (+) Family Dynamics - So, so realistic. My disbelief was completely suspended--I could picture what happened in Ethan's family happening to any family in that kind of situation. 6. (+) Character Cast - The characters in this book contribute greatly to the suspension of disbelief and add humor in the midst of the tension. LOVED Gracie so much. Adorable kid interactions. Those were the times when I completely sided with Ethan. Blake, his mom and dad, J-Dogg--all the characters that contributed to the small suburb feel of the story--gave the book an unexpected flavor. 7. (+/-) The Romance - I liked that they were friends first, that Cami was sweet and understanding and that I could understand why Ethan was so desperate for her, but Cami was also a character block. A character who didn't feel real to me. Nothing really distinguished her or made her remotely interesting as a romantic interest to me. It seemed more like Ethan was looking for someone good looking who would accept him but not Cami in specific. 8. (+) The Writing - Fantastic. Addictive. And it felt like I was reading from a guy's perspective without the guy being too self-assertive/macho/etc. and without being too general. It's was Ethan's voice, pure and unfiltered and realistic (that the fifth time I've said that word in this review? There's a reason for it.). 9. (+) The Pacing - One of the best parts of this book was that it flew by so quickly, that I didn't notice I was reading. The writing is addictive--first person, present tense, and the pacing so fast as a result that you don't notice how far you've gone until you're already halfway in. 10. (--) The Cover - I feel like the cover adds nothing to the book. While I like the dark coloring to it, I have no idea how that is supposed to convey what this book is about. Not really what I would have expected of Lisa McMann but Dead to You was a fast-paced, realistic portrayal of an impossible situation that hooked my attention from start to finish. I just finished reading and reviewing this today, and I completely agree with you on the predictability front. I was expecting something EPIC. That being said, I still enjoyed the book.